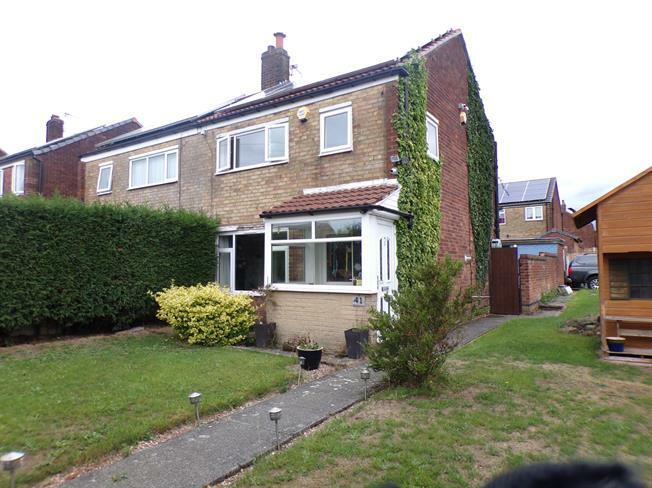 3 Bedroom Semi Detached House For Sale in Wigan for Offers Over £105,000. Coming to the market and offered with no onward chain, this three bedroom semi-detached house is available to view immediately. The property sits on a generous corner plot which means there is a massive amount of external space including a front, side and rear garden area. In brief, the property comprises of; Living room, Kitchen, Dining room. Upstairs there are three bedrooms and a family bathroom. Wooden door, UPVC double doors, UPVC window unit, ceiling light fixtures, wooden flooring, wall radiator, wall mounted fire place with surround. Wooden door, ceiling light fixture, tiled flooring. Wall and base units with worktop, integrated oven hob and extractor hood. Stainless steel sink with mixer tap. UPVC double doors, UPVC window units, ceiling light fixtures, tiled flooring, wall radiators. Wooden door, UPVC window units, ceiling light pendant, carpeted flooring, wall radiator. Wooden door, UPVC window unit, ceiling light pendant, laminate flooring, wall radiator. Wooden door, UPVc window, ceiling light pendant, wall radiator. Wooden door, UPVc window unit, ceiling spotlights, tiled flooring, wall radiator. Bath unit steel mixture taps with shower fixture, ceramic sink with pedestal and stainless steel taps, ceramic toilet unit.